Loren is a handsome little boy who enjoys being around others and spending time outside. He loves to listen to music and the sounds of kids playing. Loren puts on a ?big toothy smile? when people talk to him or when his foster siblings are goofing around. He likes the feel of the sunlight through the window and though he cannot see well, he often turns his head toward light. Loren likes to be held and touched when he needs comforted and will seek physical affection. Loren is emotionally interactive and responds to the people he knows. He also finds comfort in taking baths, listening to music, and holding a small stuffed animal, blanket and pillow. He enjoys holding and wearing things that are soft and comfy! Loren is generally calm, but can alert you when he's unhappy or uncomfortable by using facial expressions and noises to communicate his needs and wants. He has a wheelchair though he does not spend all of his time in his chair as he enjoys sitting in a beanbag or hanging out on the couch with family. 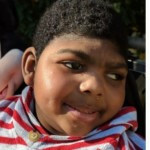 Loren needs a forever family who will advocate for him medically and educationally throughout his life. Families will be offered whatever training they may need to meet his daily needs. A family who has a medical background and a stay home parent would be a good fit, but his team is open to any family who would be willing to learn. A prospective family will need to have a home which is wheelchair accessible or have the capacity to become accessible. Loren is legally free for adoption.